The first time I heard this song was 37 years after its issue. One morning during our 2007 holiday in France, I was waiting for my wife to be ready, and watched a French movie on TV. In one of the more dramatic scenes they used a German song as background, and it really blew me away. Fortunately, the name and singer were mentioned in the dialogue as well, which allowed me to find the song upon our return. 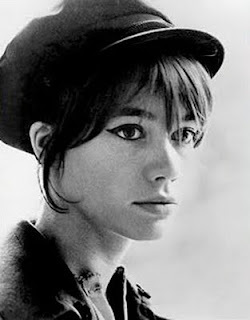 The song is called Traeume (Dreams), and the singer is the French lady Francoise Hardy (image credit), one of the most successful chansonnieres in the history of French light music. The gorgeous melody is by the German composer Martin Boettcher, who is best remembered in Europe for his numerous German movie scores, including the Edgar Wallace and Karl May series. Francoise Hardy's German lyrics are delivered with a seductive accent, and the end result is simply great.